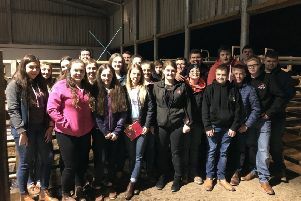 The Young Farmers’ Clubs of Ulster (YFCU) recently attended the launch of the Farmers Bash 2019, and announced their partnership with Ireland’s biggest country dance as part of their 90th anniversary celebrations. Held again at the SSE Arena, Belfast, on Friday, October 11, 2019, the third annual Farmer’s Bash promises to be bigger than ever with a line-up of Derek Ryan, Mike Denver, Cliona Hagan and Johnny Brady. Joining this fantastic line-up are the much-anticipated ‘special guests’ - this year will include The Wurzels, best known for their number one hit The Combine Harvester, who are sure to have the country crowd all on their feet. Plus, global internet sensations Steve N Seagulls. Speaking at the launch, Zita McNaugher, deputy president of YFCU, said: “It’s an amazing opportunity for YFCU to be involved with the Farmer’s Bash as we celebrate our anniversary. “I’m really looking forward to an evening of celebrating 90 years of the YFCU along with fellow members at Ireland’s largest indoor country music event. It’ll be one massive party not to be missed. “YFCU HQ will be selling tickets through club secretaries for the event from mid-April.